The decor inside of the Parliament Building in Ottawa, Ontario in Canada is stunning in each of the rooms. Tour through the Parliament Building while visiting the city of Ottawa, Ontario in Canada and see the amazing decor in each of the many rooms that you can see. A tour guide will take you through and in this room, beautiful wood outlines the walls with chairs matching as frescoes adorn the upper section of the walls. Inside tour of Parliament Building, Ottawa, Ontario,Canada,North America. 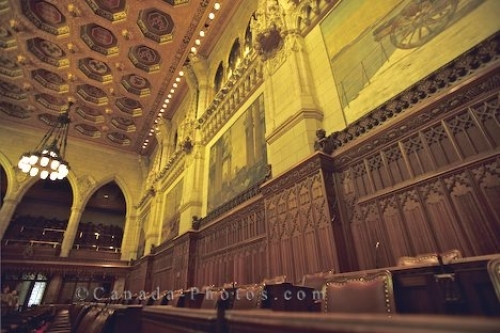 Picture of the wooden decor and frescoes inside the Parliament Building in Ottawa, Ontario in Canada.